Lieutenant Colonel Richard Joseph Berrettini joined the Pennsylvania Army National in 1984. He enlisted in the United States Navy on July 16, 1973, as an internal communication specialist. He transferred to the United States Army Reserve on May 21, 1981. In 1996 he became a clinical nurse and in 2001 head nurse. LTC Berrettini achieved his bachelor’s degree in 1998 from St. Joseph College and his master’s degree in 2003 from the University of New York. As a civilian, Berrettini was a nurse for the Port Allegheny School District for 14 years. LTC Berrettini’s awards and decorations include the Bronze Star, the Purple Heart, the Army Commendation Medal, the Army Achievement Medal (with 1 Bronze Oak Leaf Cluster), the Navy Good Conduct Medal, the Army Reserve Components Achievement Medal (with Bronze Hour Glass Device), the National Defense Service Medal (with Bronze Service Star), the Afghanistan Campaign Medal, the Global War on Terrorism Service Medal, The Armed Forces Reserve Medal (with “M” Device), the Army Service Ribbon, the Overseas Service Ribbon, the NATO Medal, the Pennsylvania Meritorious Service Medal, the Pennsylvania Commendation Medal, the MG T. R. White Medal, the GEN T.J. Stewart Medal, the Combat Action Ribbon and the Combat Medic Badge. 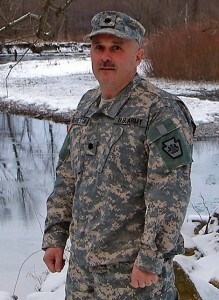 LTC Berrettini volunteered to serve in Afghanistan and was assigned to the South Carolina Army National Guard on February 7, 2007. He died January 11, 2008, at Brooke Army Medical Center, Texas, due to injuries received from an improvised explosive device attack in Khowst Province, Afghanistan. He was the second officer and the 39th Pennsylvania Army National Guard soldier lost in combat since the 9/11 attacks. He was also the first serviceman from Luzerne County to be killed in Afghanistan.